At Northland Sheep Dairy our sheep cheese is made with raw milk produced by our own Certified Organic and Certified 100% Grass-fed flock. The ewes lamb in mid-April, and we begin making cheese in late May. We milk the sheep twice daily throughout most of the season, and make cheese until the animals are dried off in late October. This means that all of the cheese we make is from milk produced by exclusively pasture-fed animals. The sheep are fed hay during the winter months when they are not lactating. 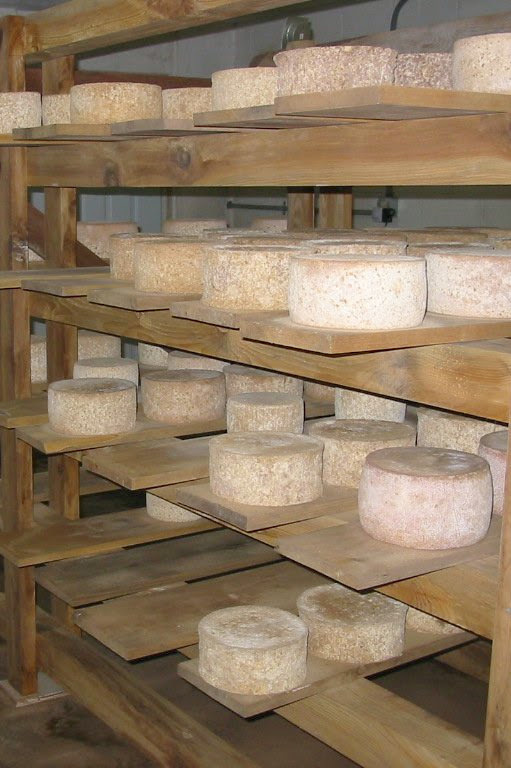 We make cheese approximately every other day throughout the season, and our cheeses are aged in our cheese cave for four months to two years where they develop natural rinds. Please see our current selection of cheeses below. A rustic Pyrennean-style natural rind hard cheese made with organic lamb rennet. Aged 4-12 months. Savory and nutty. This is great for a cheese plate, served with fresh apples and pears or dried apricots. It's also a wonderful addition to a potato gratin -- remove the rinds and grate it on top. A Roquefort-style blue cheese made with organic lamb rennet. Aged 4-9 months. Creamy, with hints of mushroom. Delicious crumbled into green salads, or add to roasted beets or squash. A Pecorino-style hard cheese with a natural rind. Made with organic lamb rennet. Aged 12-24 months. Deeply flavorful with caramel notes. A soft cheese in the Spanish Extremadura style, coagulated with home-grown cardoon flowers.